Here at the Decorative Concrete Experts, we specialize in installing, replacing, resurfacing, and maintaining concrete and concrete products. 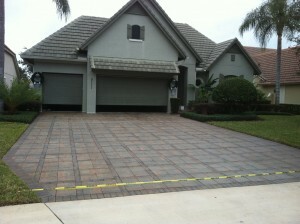 Pavers are extremely popular in Central Florida and a large percentage of new driveways and pool decks use this surface. Like any concrete exposed to the elements, pavers will wear and fade significantly over time. Periodically as part of your normal home maintenance, you should thoroughly clean and seal your pavers. Paver sealing is not for the average do-it-yourselfer. The steps are not very complicated and everything looks pretty easy to do but there are some pretty common mistakes that can ruin the look of your pavers. There are a few very common issues that we come across. White hazing is fairly common and sometimes cannot be corrected. Another issue that we run into a lot is peeling and flaking of the existing sealer. This is another issue that we sometimes can’t correct depending on if a non-compatible product was incorrectly selected. The Decorative Concrete Experts of Orlando use only the best non-yellowing sealers that will bring back the original color of the pavers and protect them for years to come. This driveway below was fading pretty badly and we were able to bring it back to new condition with our top of the line sealer designed for professional installers that you will not find at your local Lowes or Home Depot. We serve the greater Orlando area and would love to help with all of your pool deck and driveway paver sealing needs. 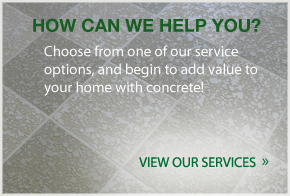 Call the Decorative Concrete Experts today at 407-342-8552. We often encounter backyard spaces that are unused for a variety of reasons. A lot of the time it’s hard to get grass to grow with dogs tearing the up the area or having lots of foot traffic from kids playing outside, etc. 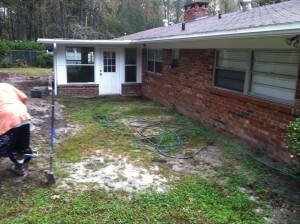 This outdoor space to the right had the issues listed above in addition to not draining water properly. We were able to excavate the area and use our laser level to make sure that our surface elevations allowed water to drain properly off of the new patio space. We are very fast on these small projects. 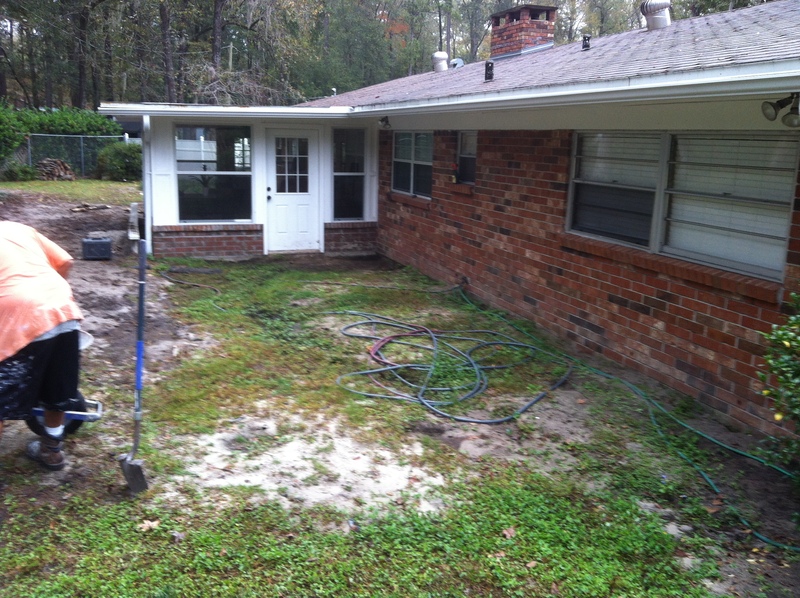 We were able to transform their backyard in only 3 working days over the course of a normal 5 day work week. This will provide plenty of area for a table and chairs and a grill to entertain friends. In addition we added a sidewalk around the Florida room to a very small existing patio adding functionality to their current features. 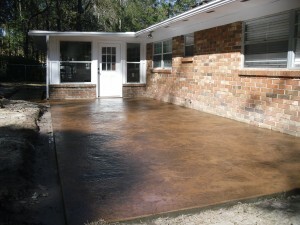 Stamped concrete offers a competitive price coupled with the most durable, low maintenance surface that money can buy. Call the Decorative Concrete Experts today at 407-342-8552 to create the outdoor living space that you have always imagined. I’m excited to announce that we have started producing an extremely high quality fire pit for the Orlando market that is unlike any other product available. Our fire pit is cast as one piece with a high strength, fiber reinforced concrete mix design and utilizes an insulated liner that will allow it to last for decades. The exterior is hand stained to reproduce the look of natural stone without the cost and complexity to build. Our standard fire pit will be set up for a traditional wood burning fire and there will be an option to burn natural gas. These firepits will be available as cast in place on your existing concrete slab, pool deck, or paver patio or built at our facility to be delivered and installed in as little as a few hours. The cost is very competitive with similar mason built units that are held together with mortar and use stone veneers. 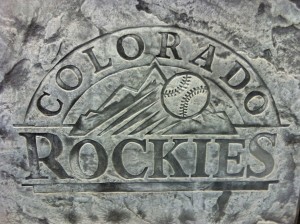 Check out our site OrlandoFirePits.com to find out more and contact us to get information on pricing and availability. So you’ve decided that it’s time to have your deck repainted, where do you start? A good place to start is to develop a list of questions to ask when you’re interviewing a prospective contractor. 1. What is the age of the surface and when is the last time (if ever) that it has been painted? This question is generally asked to establish whether the pool is an older kool deck surface that has never had a sealant applied or if it’s a newer acrylic texture. This is important because a kool deck that has never been sealed will need a lot more product applied to seal the surface. The newer texture will need to be examined to determine what type of coating it has been sealed with. In addition it may be necessary to add a skid resistant admixture to ensure that the deck remains non-slip with the addition of layers of sealant that tend to fill the traction adding voids in the surface. 2. Do you have an idea of the square footage that needs to be repainted? 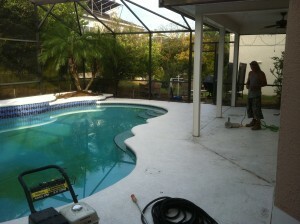 Here at the Decorative Concrete Experts, we do a lot of pool deck repaints. This question is used to get an idea of the scope of the job so that we can give an approximate cost figure over the phone. This allows us to see if the job is within the customer’s budget over the phone. This figure doesn’t need to be exact, it’s just to get a good idea. The easiest way to figure square footage is to sketch out the area on a piece of paper and divide the areas into rectangles that you can multiply length x width. You can subtract out obstacles such as the pool and planter beds. 3. Are the cracks mostly smaller hairlines, or do you have some noticeable height difference where slabs have shifted? When there is a height difference, it may be necessary to mill down the high side and texture it to match to remove a trip hazard on the surface. This is especially important on commercial pools where liability is a larger issue. We inject a sealant into the cracks that seals out water, prevents insects from entering, and keeps weeds from growing. The sealant is carefully placed so that the crack blends into the deck and is actually less noticeable than before. Beware of “contractors” that apply a crack filler with a putty knife that actually makes the crack stand out and look more obvious. 4. Is the surface in sound condition or are there areas that have flaking paint and/or texture? 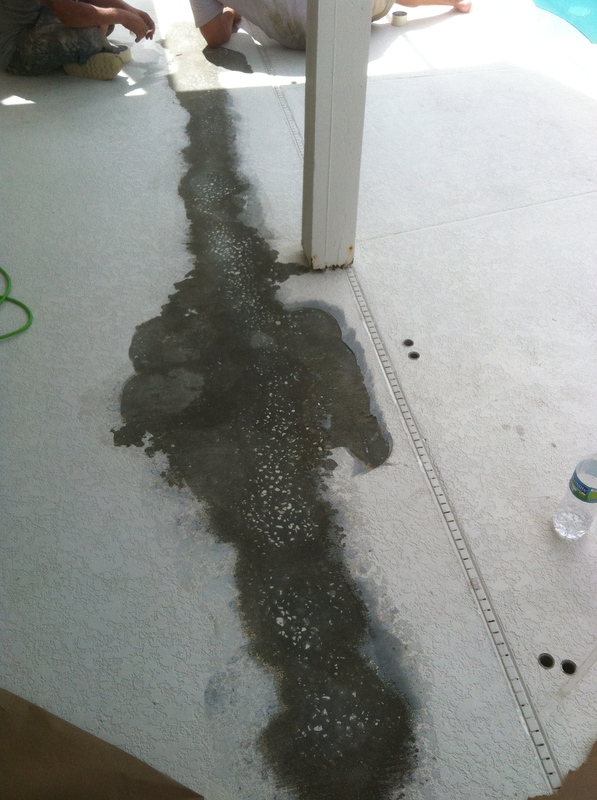 Occasionally we come across decks that have had the wrong sealant applied at some point. Generally when this occurs, it’s necessary to see the job in person to determine the most cost effective way to remedy the problem. Also, many customers call us because the textured surface is delaminating. This problem can be limited to small areas that we can patch and blend into the rest of the deck. Sometimes it is an extensive issue that can only be fixed by removing and replacing the entire surface. When it is time to have your pool deck repainted, trust the Decorative Concrete Experts to do the job right the first time for a fair price. Call us today at 407-342-8552. Visit our Orlando pool deck paint page here. As a decorative concrete contractor, I have the opportunity to look at a vast number of pool decks both in plans and in person for remodeling consultations. It is a rare occasion for me to see a pool deck that grabs my attention and makes me want to take a picture so that I can borrow an idea or design. For the most part, pool decks in Orlando, Gainesville, and Ocala are extremely similar in layout and deck surfacing. I would say that most of the pool decks are rectangular in shape and have either a plain acrylic texture coating or pavers installed. There are some features that builders add to make the design visually appealing. Some of these features are landscape beds integrated into the deck and free form pools that take a custom shape. There are a lot of options that can give you a one of a kind pool deck and a back yard oasis that will make people notice. The first step is finding a concrete contractor and/or pool builder that welcomes custom work. Many pool builders are caught in the trap of selling the same set of plans over and over. If you are building a high end home and are having the pool done a the same time, it can be extremely beneficial to involve your architect in your pool planning. Having a one of a kind pool deck doesn’t have to be extremely expensive. Find a pool contractor that is open to working with a decorative concrete contractor that specializes in more than just basic textures. At the Decorative Concrete Experts we offer a range of products including acrylic textures, stamped concrete, and a hand troweled StoneCrete surface. 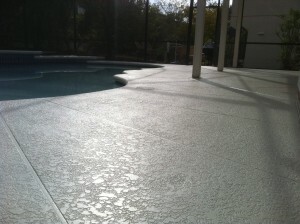 The acrylic texture is the most popular type of pool deck surface currently used in central Florida. Many people still call these acrylic textures Kool Deck. Today there are many patterns available to give the deck a unique look. You can visit our decorative acrylic texture page to view some examples of my work. 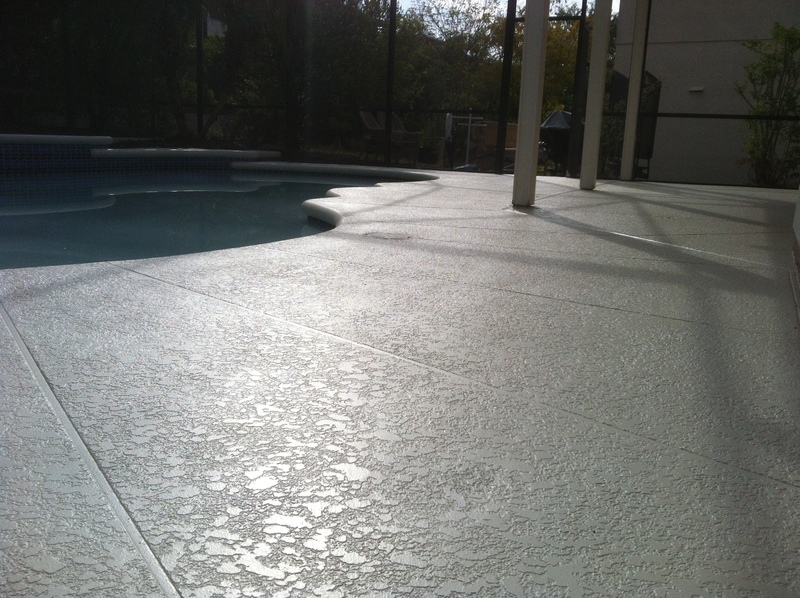 Stamped concrete is almost non-existent in the Orlando residential pool deck market. This surface has become hugely popular in California, Texas, and Las Vegas, yet it is rarely used on residential properties in central Florida. Simply installing a stamped concrete surface that coordinates with your home will give you the most unique pool deck in your neighborhood. Stamped concrete is a hard product to install and many builders stay away from it because they’ve had a bad experience with someone that didn’t know what they were doing. 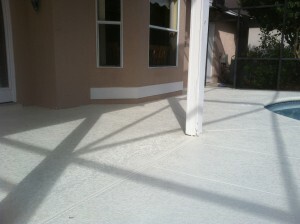 Click here to see some pictures of our stamped concrete installations. We have the experience and take the time necessary to ensure that you have the best looking stamped concrete available on your pool deck. Our hand troweled StoneCrete overlay is another surface that isn’t commonly seen on new pool deck construction. 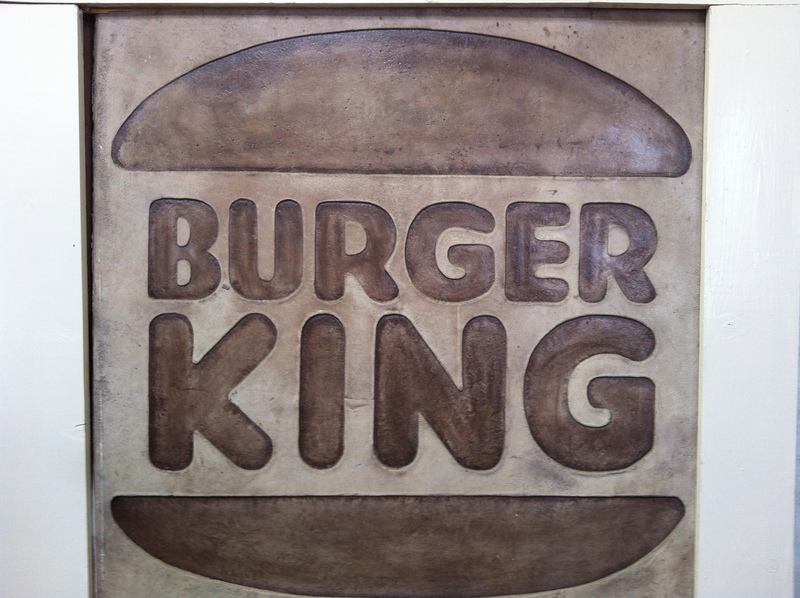 This product has the look of natural stone at an affordable price point between acrylic texture and stamped concrete. In addition, this is a great product for remodel work on your older surface. StoneCrete is much easier to work around obstacles than stamped concrete overlays. If you’re not sure what you are looking for and would like some professional help, contact the Decorative Concrete Experts of Orlando at 407-342-8552. By simply printing out a few pictures that you come across and collecting some color samples that you like, we can work with you to conceive a design that will be truly one of a kind. 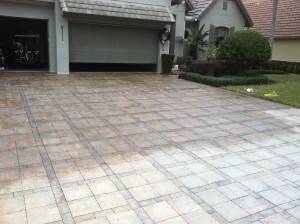 The Decorative Concrete Experts of Orlando are your source for professional installation of stamped concrete. When you are looking to add Stamped Concrete to your home or business, it is best to start by looking at the basic construction of the building that the concrete will be accenting. The key to this process is by choosing a surface that will complement the structure, not try to match it. For instance, on a brick home it may be a good choice to implement a brick border on your driveway or walkway but not necessarily install a solid stamped brick pattern. With stamped concrete, incorporating the right color is just as important as choosing the right pattern. Again, the key is not to match but to use hues from the building or complementary tones into the stamping work. Looking at stamped concrete patterns can be overwhelming. 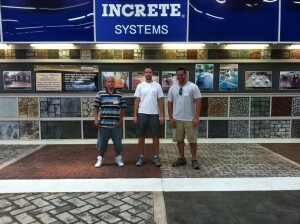 This is where in can be beneficial to talk to a stamped concrete installer. A quality installer will own as many as five or ten popular patterns and will know which ones will work with your project. An installer that owns many sets of stamp mats is serious about this business because these sets are very expensive to purchase. Ask a stamped concrete contractor that you’re meeting with to bring by some common mats that they own to see if any will suit your needs. If the contractor rents his/her stamping mats, it may be best to steer clear. When the stamped concrete is part of a building remodel or larger landscape project, it can be helpful to get input from the architect or landscape designer. 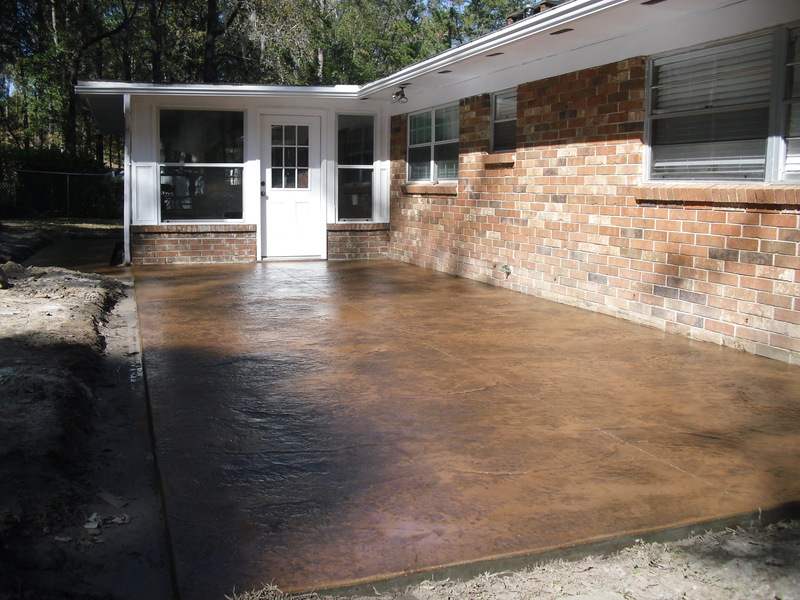 There are lots of online sources for stamped concrete ideas if you are lost. We are a certified installer for Increte Systems and can help you implement any of their products in your project. Increte recommends us for project inquiries in Orlando and surrounding areas. 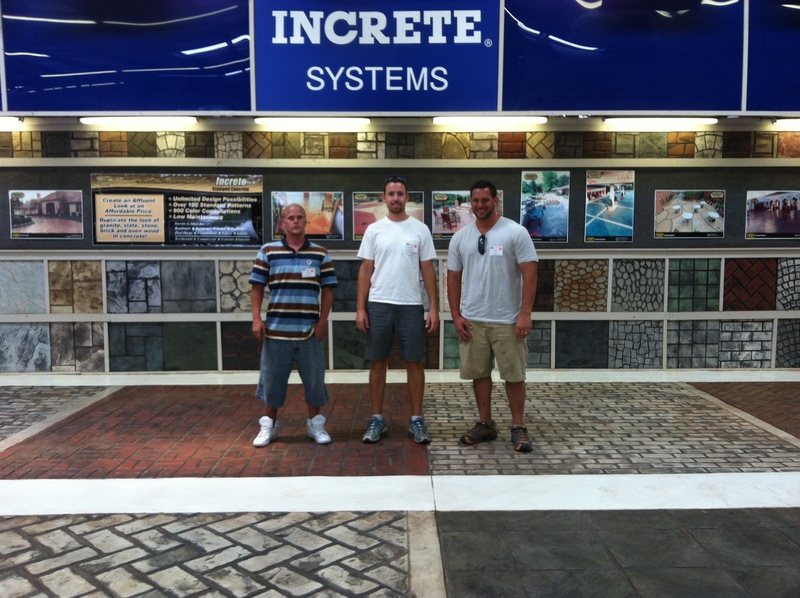 Click here to see Increte’s site for stamped concrete and other decorative finishes. Doing an internet search can be a very valuable source of ideas for your stamped concrete project. The best part is that you can easily print out a copy to show a stamped concrete installer. Now that you are interested in decorative concrete you will probably start to recognize a lot more of it when you least expect it. If you come across some stamped concrete that you really like, take a picture or take note color and pattern. 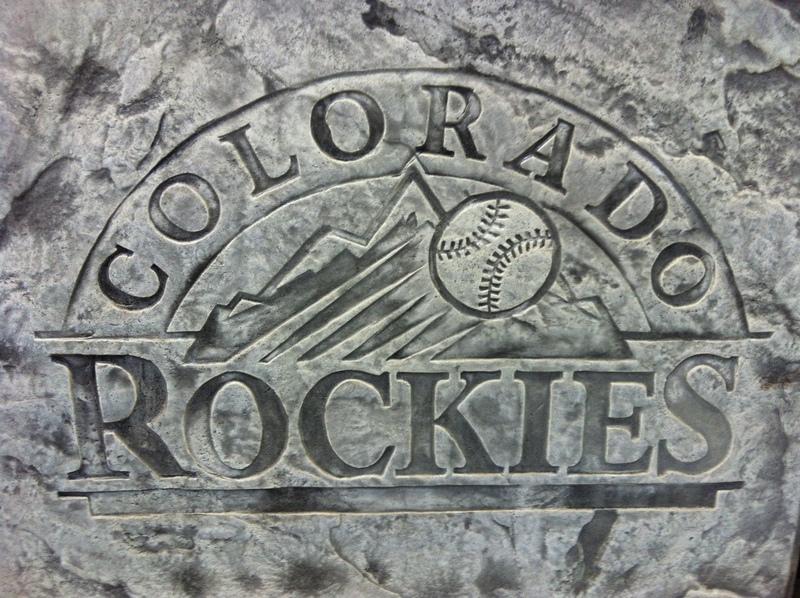 Replicating decorative concrete is made much easier when you have lots of details and pictures available. 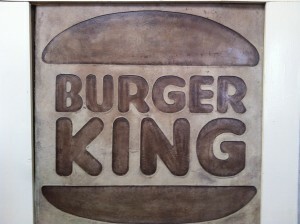 There are many great examples of stamped concrete in our theme parks here in Orlando. Stamped concrete is widely used in theme parks for its durability, relative low cost, and ease of maintenance. While visiting the parks keep an eye out for design ideas and which patterns that would work well on your particular project. Contact the Decorative Concrete Experts in Orlando for all of your stamped concrete needs at 407-342-8552.